A pair of goals on either side of halftime Friday afternoon helped lead the NIU men’s soccer team to a 4-0 win over DePauw in the final preseason game of the fall. Senior Dusty Page (Germantown, Wis./Kettle Moraine Lutheran), freshman Alex Saliba (Rhode-St-Genese, Belgium/European School of Brussels 1), senior Andrew Palumbo (Ft. Myers, Fla./Bishop Verot/Darton College) and senior Isaac Kannah (Plymouth, Minn./Prairie Seeds Academy) all found the net for the Huskies. “On the whole it was good,” said NIU head coach Eric Luzzi. “Anytime you score four goals, that is always a good thing, and we scored some good goals today, both from set pieces and the run of play, and created some other good chances, so that is all encouraging. NIU pulled in front in the early moments as Page got a head on a corner kick from sophomore Albert Levett (Southend-on-Sea, England/Befairs High), nodding home from inside the six-yard box past the DePauw goalkeeper to give the Huskies an early lead. DePauw responded with a good chance from Mitch Tabler in alone on goal that forced a save from redshirt junior goalkeeper Andrew Glaeser (Walla Walla, Wash./Walla Walla/Oregon State) to keep the Huskies in front. 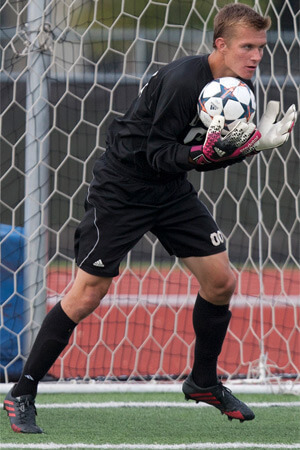 Glaeser and freshmen Drew Donnally (Plainfield, Ill./Plainfield North) and Eddie Kim (Morton Grove, Ill./Niles North) each played approximately 30 minutes in goal for the Huskies. 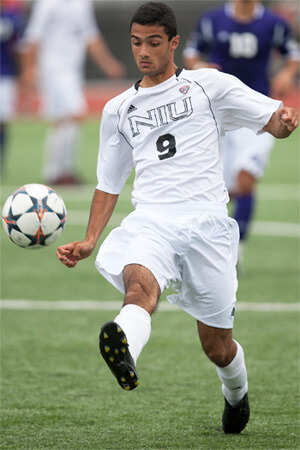 Shortly before the intermission, NIU doubled its advantage through Saliba. After a cross came in from the right side, Saliba got on the end of a deflection inside the box and put home a second goal for NIU. After the break, DePauw had the first chance as a free kick from 25 yards out came off the crossbar. Minutes later, it was NIU hitting the bar as a shot from distance by Levett came back off the post. As the second half wore on the Huskies saw much more of the possession, pinning the Tigers back inside their own half. NIU was rewarded for its second half dominance with about 10 minutes to play as junior Bertrand Gaschot (Austin, Texas/Westwood) earned a penalty kick and Palumbo slotted home from the dot to push the Huskie lead to 3-0. With just two minutes left, Kannah finished the scoring with a goal from outside the 18-yard box as the Huskies closed the preseason with a 4-0 victory. NIU will open the 2014 regular season on Friday, Aug. 29, when they take on Hofstra in the Northwestern Lakeside Classic in Evanston, Ill. Game time is scheduled for 4:30 p.m.